My intention is to create portraits of Australian feminists with the view to develop a touring exhibition of photographic Cyanotype framed prints, together with a book, to raise the profile of feminism and the history of feminism in Australia. 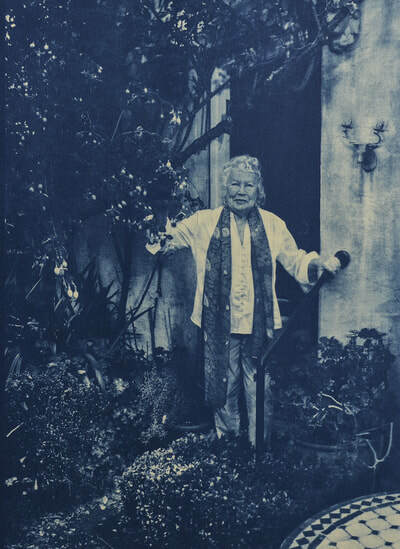 After spending some time with Merle Thornton AM, in conversation and photography, to create her portrait for an art prize, I decided to print the portrait using the blue Cyanotype photographic process due to the term 'Blue language" that Merle used when describing the way men spoke to her and other women when they spoke out - essentially bad language, swearing. The women in my Sticks & Stones portrait project will be bathed in blue, via the Cyanotype process, to emphasise the 'blue language' aimed at women in an effort to control and suppress those of us who dare to speak out on social media or anywhere publicly. This work is also a nod to Anna Atkins who is considered the first female photographer, and who published a book of Cyanotype images in 1843 - Photographs of British Algae: Cyanotype Impressions. I will be applying for grants, using crowd funding campaigns and seeking support or sponsorship where I can, over the next 6 months to make this project a reality that I plan to work on over the next year or 2. If you are interested in assisting in my project in any way please contact me via the contact page. Although I have a burgeoning list already I am open for any suggestions on Australian feminists who may be interested in sitting for a portrait for this project. Thanks for reading about my project and I look forward to making this project a reality.